The University of Toledo Medical Center’s commitment to the equal treatment of all lesbian, gay, bisexual, transgender and questioning patients has been recognized for the seventh consecutive year by the Human Rights Campaign Foundation with its “Leader in LGBTQ Healthcare Equality” designation. The recognition was recently reported in the 2018 Healthcare Equality Index. The Health Equality Index is sponsored by the Human Rights Campaign, which is America’s largest civil rights organization working to achieve LGBTQA+ equality. In addition to being a valuable tool and resource for health-care facilities, the Health Equality Index is used by LGBTQ patients and their loved ones to find facilities that provide equitable and inclusive care. The annual survey consists of questions that determine whether a hospital meets the core requirements to become a leader. A record 626 health-care facilities participated in the 2018 survey. 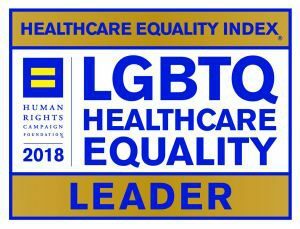 Of all those included in the Healthcare Equality Index, 418 nationwide earned a “Leader in LGBTQ Healthcare Equality” designation. UTMC is the only medical facility in northwest Ohio to earn this distinction and one of only 24 in the state. This entry was posted on Wednesday, April 25th, 2018 at 3:53 am and is filed under News, UTMC, UToday .